The following is a summary outline of the second episode of “Eat Live, Live Well” by Raederle and Jay. Click here to open the audio for the show. This episode is about getting enough nutrition on a primarily (or entirely) raw and vegan diet. It's also not uncommon for an unread raw vegan to develop teeth problems. Follow a meal plan when first entering a 100% raw diet, or change your habits slowly and learn about the new foods you incorporate. Occasionally analyze the mineral content in your diet by using a free online tool like Calorie Count or Cron-o-Meter. Drink a gulp of water and squish over your teeth at the end of a meal. Do not brush immediately after eating. Read your toothpaste ingredients and consider them carefully. Brush with baking soda and drinking water once a week instead of using any toothpaste. Brush with plain drinking water once a week. It is completely possible to get enough of all of these nutrients, but certain aspects of the modern lifestyle make us less likely to get enough of them on a raw vegan diet. As many as a third of Americans are estimated to have a deficiency in B12, vitamin D or calcium. Less than 3% of Americans are vegetarian. Less than 1% are vegan, and even fewer still are raw vegans. Vegetarians do not eat meat, and many do not eat fish. Vegans also abstain from eggs, dairy or any products from any animal. Raw vegans also abstain from processed foods including cooked foods. Many raw vegans eat 90% raw and 10% cooked. There are successful, healthy raw vegan people who eat wholly (100%) raw and have done so for ten to fifty years (or possibly more, but I don't know for sure specific examples for more than fifty years). Vitamins B12 and vitamin D are not present in plant foods. There isn't any reliable source of these nutrients – in any diet. Vitamin B12 is created by a bacteria that is found in abundance in soil. Healthy soil is rich in B12. Animals get B12 by rolling in the soil and eating unwashed food. Humans used to get plenty of B12 from well-water, river-water and home-grown produce. Vitamin D is generated from sunlight. Animals, including humans, create it when our skin is exposed to sunlight. Contact with hormone analogs from plastics (such as polyester clothing), birth control, prescription drugs, pesticides, and other chemicals trick the body into treating outside influences as normal human hormones. This destroys hormonal balance. Vitamin D is actually a hormone created by the body. My belief is that we will not generate vitamin D correctly if our other hormones are not in balance. Animals are no longer a good source of B12 or D.
Even “free-range, cage-free” chickens are often kept in barns – out of the sun for their entire lives. These chickens are deficient in Vitamin D and so are their eggs. Cows and other animals are given antibiotics. Antibiotics kill off the bacteria that creates B12, and thereby the animal becomes deficient. Pesticides used on the feed crops (corn, soy, grass, etc) also kill off the bacteria that create B12, making the soil deficient. The crops become deficient and the animals that eat those crops. Sea vegetables are often said to have B12. They do not. They contain B12-analogs which are not used in humans. Use coconut oil, shea butter or another natural oil to protect the skin and get out into the sun daily. Do not let yourself burn. Tan very lightly and very gradually. This only works in sunny climates. Use an oil-based soap that doesn't dry out the skin with the use of chemicals. This enables healthy skin to utilize the sun. Eat plants unwashed from your garden. Ferment your own home-grown vegetables. Have your soil analyzed by a lab to check for healthy B12 content. Have your blood tested to check your vitamin D and B12 levels. It is advisable to take a vitamin D and B12 supplement. I do not recommend taking supplements for most other nutrients. You can get plenty of calcium, selenium, niacin, magnesium, potassium, etc, from a plant based diet that is primarily or wholly raw. Beware: many supplements are a scam and do not contain anything bio-available. You can read more about the supplements I take and why in my article "Supplements." Vitamin C is not ascorbic acid. Ascorbic acid is the “wrapping” of the vitamin C complex, which contains an enzyme. Vitamin C is completely destroyed by cooking because it contains an enzyme. Ascorbic acid only affects the common cold by raising acidity in the body. Bacteria doesn't like acidity. Unfortunately, your body doesn't like too much acidity either. There is a detailed discussion of this topic in the book Empty Harvest. Getting enough vitamin C in the diet is easy. Half a bell pepper will provide a full day's supply. Click here to read my article containing ten different ways to easily get enough vitamin C.
Sodium: 1486 mg, a good amount of sodium for one day. Calcium: 1104 mg, that is 110% the recommended daily allowance. Full day supply of: B2, B6, Folate (B9), Vitamin A, Vitamin C, Vitamin K, Calcium, Magnesium, Potassium and Omega-6. Let's say someone wants to start eating healthier today, but they don't want to make these common errors, what can they do? Start replacing processed foods with new and exciting recipes. Pick a less-than-ideal food that you aren't attached too and replace it with a new healthy recipe. The only tool you need is a fork. Takes about three minutes to prepare. Takes about twenty seconds to clean up. Another great way to start making an easy transition is to start adding something raw to every meal. If you're eating pasta: Let the pasta cool until it is warm before adding fresh raw tomato sauce. Fresh sprouts can be added to sandwiches, wraps, smoothies, salads, pasta dishes or anything at all. A side salad can be present at every meal. Breakfast could be an entirely raw or mostly raw smoothie or just plain fresh fruit. What if someone wants to make a complete transition to a raw diet and they don't want to mess up? Get a step-by-step nutritionally complete meal plan to guide their raw vegan diet. Raederle offers several options which you can see here. Foods high in iron per calorie: Parsley, dill, basil, spinach, beet greens, asparagus, sage, chard, cilantro, and dandelion. 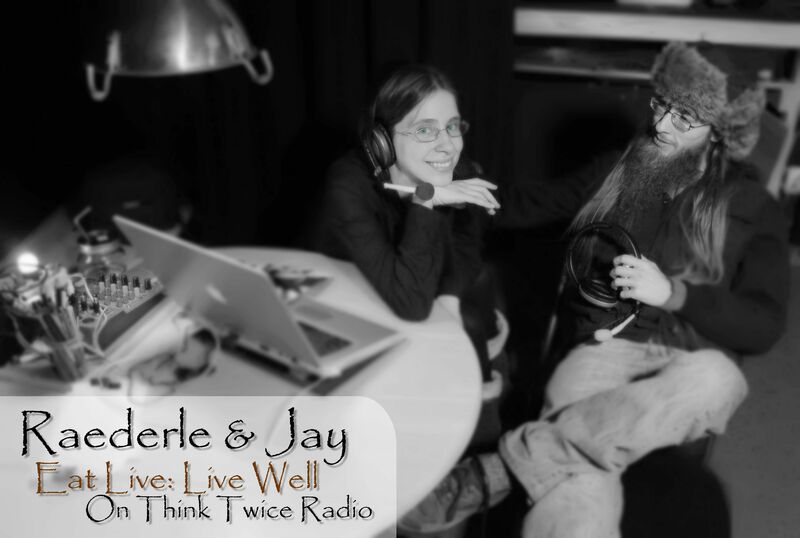 Thanks for listening to Eat Live; Live Well with Raederle and Jay. If you have a heath or fitness question you'd like us to answer on the show, e-mail us your question.